Alexia Allen fights fires. 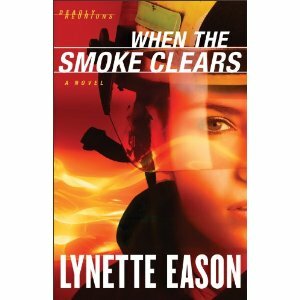 Well, she used to fight fires until she is suspended from her job pending an investigation into a seemingly innocent accident that occurred while trying to save a child from certain death. Now, out of work and disenchanted, Alexia decides to take refuge in her hometown under the guise of a high school reunion. Alexia hasn’t been home in ten years, but trouble has no problem recognizing her as she stumbles upon a murder within moments of her arrival. Alexia, not even given the chance to confront her troubled past that caused her to flee 10 years prior, finds herself at the center of another investigation as a series of murders, attacks, and suspicious incidences plague her and clout her innocence. Will handsome Detective Hunter Graham, who once carried a secret torch for Alexia, be an ally or the man to put her behind bars? Will Detective Graham’s feelings return, and if they do, will he do something about it this time around? Will the secrets of her past help her to solve the mystery of today or will it lead her into darker waters? A whole lot of questions….most will be answered. Once again, the synopsis of this book intrigued me and I was so looking forward to reading this book. Unfortunately, I was disappointed..again. I still have not been able to determine if I just don’t like Christian mystery due its genre limitations or I have yet to find an author who can deliver what I am looking for. This book was well written and had an interesting plot. Actually, there were several story lines, which worked in the author’s favor seeing as I was able to predict the ending of one of the main story lines. If the story line I predicted was the only one, I honestly don’t know if I would have kept reading. As with other Christian fiction I have read, I found there was just enough mention of God in the book to call it Christian fiction, but it was neither a main part of the story nor a main part of the characters. Overall, the book has a great story line and I am intrigued enough to keep reading the series. I actually just purchased book two last week. I give this book *** (3 Stars). I think I’ve read a book by Lynette before but can’t be positive. Please don’t give up on Christian suspense. It’s my favorite. There are so many, but here are a few…Brandilyn Collins, Kathy Herman, Joel Rosenberg’s novels, Robert Whitlow, Mindy Starnes Clark, Dana Mentick…I’m missing so many and I’m sorry my mind has gone blank, but that is just a very few to read. I can look through our Media Center shelves and give you tons more if you want! Previous Previous post: God is Good, Oh, So Good!